Love is in the air and my mantel is all decked out. I love creating mantels and am especially pleased with the way this Valentine Mantel came together. The focal point of the mantel is the adorable printable that I downloaded from Jen at Tatertots and Jello. I used the gray version but she also has a pink version too. I love the quote that she used. If you are a regular reader of my blog, you know that my blog title is also a Beatles song. I had the aqua frame from my Spring Frame project from last year. It worked out perfectly and I love the aqua and pink color combo. 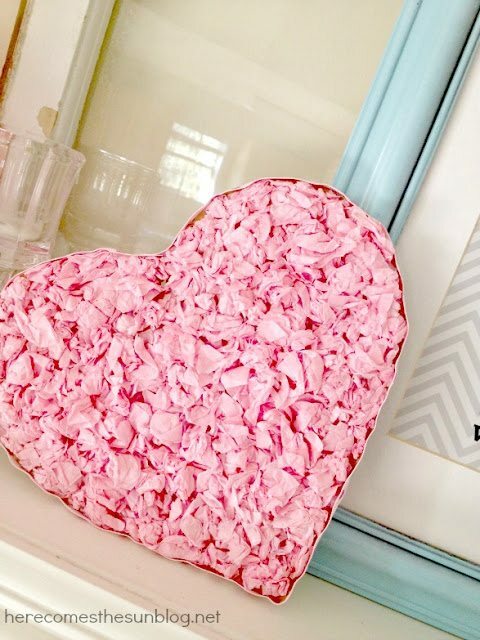 The pink heart is my Valentine Hanging project from last year. I simply removed the ribbon and tipped it on its side. I also made the paint chip banner last year as well. The pink lanterns were from my daughter’s Princess Party. They have been sitting in my garage and I have almost thrown them away on numerous occasions. I’m glad I didn’t! The votive candle holders are from my New Year’s Mantel. I may fill them with conversation hearts. 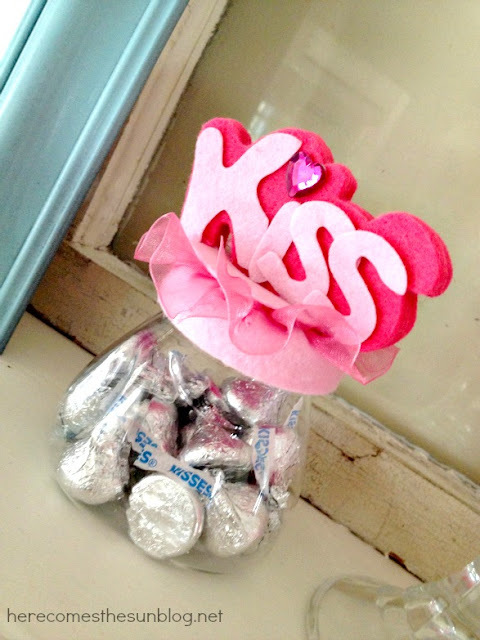 I got the “kiss” jar from the Target dollar bin last year and filled it with hershey kisses. I love that you can pull together a festive mantel for practically no cost at all. Total cost: $1.59 (I sent the print to Costco). 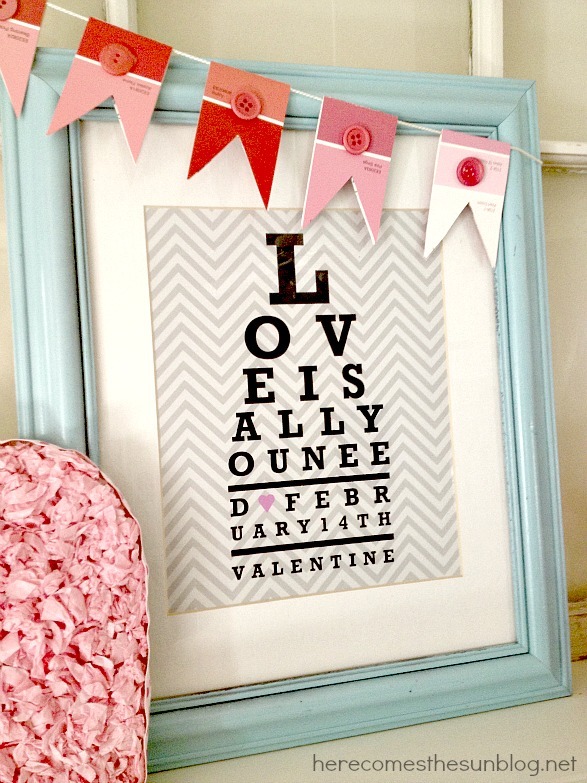 I’ve got a few more Valentine projects in the works that I’m excited to share in the next few weeks. « Win a Kindle Fire! Love the color combo!! It looks great, Kelly! Love the colours and the word art too!! 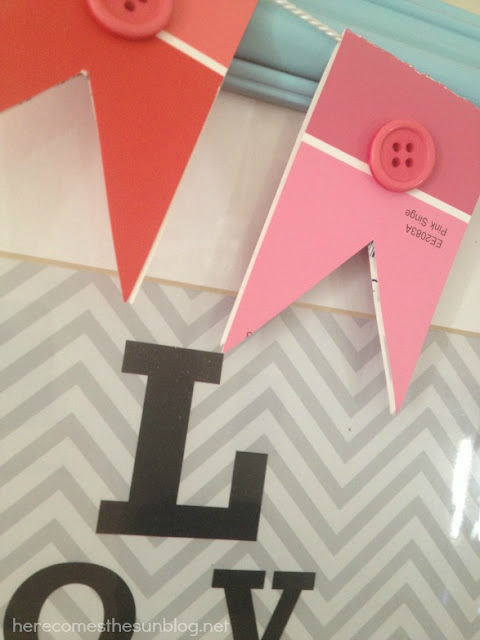 do you have a post about how you made the paint chip banner? It looks like you mounted it on tagboard? I love the paint chip banner and the tissue paper heart!! Be cuter! I just pinned this! Love! So cute! I chose aqua and hot pink as my mantel colors this year. So fun! Super cute mantel & love the colors. Come link up with me sometime @ DearCreatives.com I’d love to have you join in. Off to check out some other posts here. What great projects! I love how they all come together! Darling mantel! 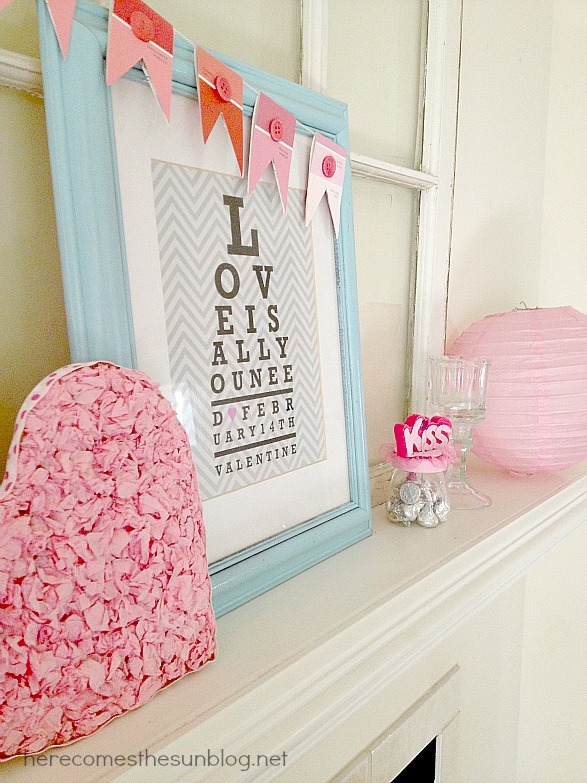 I love the pop of aqua and that paint chip garland is so creative and CUTE! 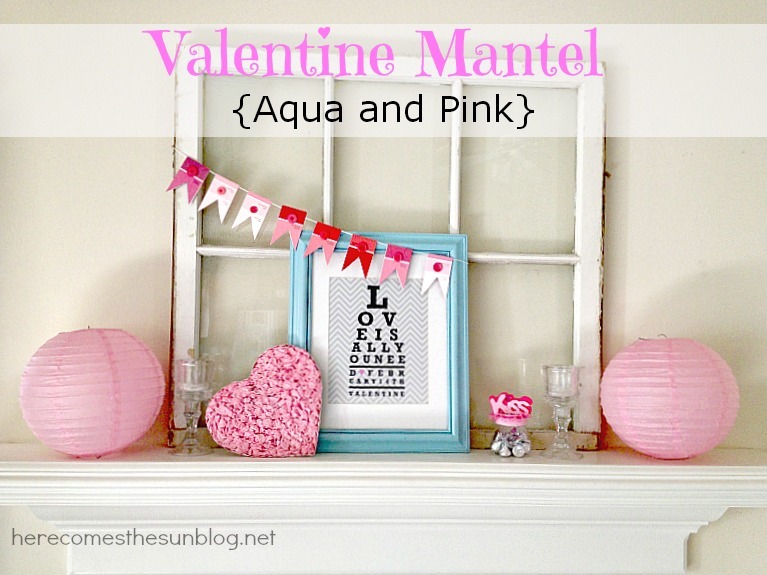 Just featured you on my 2013 Valentine’s Mantel Blog Post! Thanks for the inspirations! I love this mantel, especially the paint chip garland…too cute! Oh I love how the aqua and the pink look together!! What a fun mantel and I love that you used so much of what you already had!! Soo pretty! I featured this post today on my Valentines roundup! Thanks for linking up!